Personal and tactile, at once mass-targeted and intimate, mobile is revolutionizing business and marketing, creating new industries and developing unprecedented brand engagement and loyalty. Inextricably woven into the buying journey and consumer lifecycle, mobile creates the most direct and closest connection brands can have with their customers. Including mobile as core to your strategy is only a first step. To stay ahead of the competition, brands need to understand how to optimize mobile not only within the marketing mix, but within the mobile mix itself. We’re presenting a series of CMO Connect panels this year. Each panel brings together a different set of CMOs to share different perspectives of the impact of mobile and future of marketing from the C-level perspective. Last week we hosted a CMO Connect session between Peter Hamilton, CEO at TUNE and Marissa Tarleton, CMO at RetailMeNot to hear how a top retail brand thinks about mobile as part of the consumer journey for all kinds of e-commerce businesses. Marissa Tarleton is the chief marketing officer of RetailMeNot, Inc. In this role, she directs all consumer brand advertising, customer acquisition and retention, search engine marketing, public relations, internal communications, business-to-business marketing, and customer relationship management. Peter Hamilton: Thank you for spending some time with us today. Marissa has done really incredible things through RetailMeNot. Her team expanded the way that today we think about mobile as part of the consumer journey, not just at RetailMeNot, but for all kinds of e-commerce and retail customers all over. So, why don’t we start by hearing it direct from your mouth? 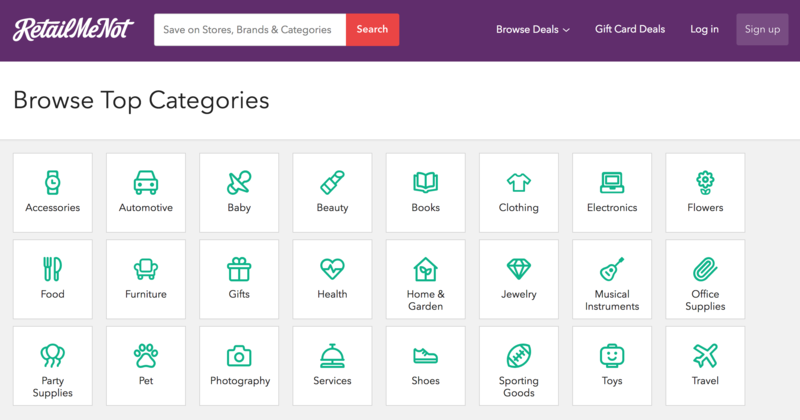 What exactly is RetailMeNot? Marissa Tarleton: Yeah, so for those of you who have not used RetailMeNot, RetailMeNot is what I like to call a savings destination, so it’s the digital tool that connects retailers/brands to consumers through this concept of savings. So, we have hundreds of thousands of offers, from discounts, coupons, in-store sales, stuff on our website and in our app that shoppers can save with, or they can use it in their home, so savings destination. And the target has been a business venue to capture all the mobile in-store opportunity in the retail space and in the dining space, which has been really a big part of our product recently. Peter Hamilton: About how much of that experience is mobile, if you can tell us? Marissa Tarleton: Over half of our business is now mobile. If you look at some of our advertising, over 70% of our email audience is actually using our platform on their mobile device. So, one of the things we sort of happened into, not knowing how much of an impact it would have, is this concept of capturing a mobile moment, where it’s about shopping and driving traffic into a retail store. And that became part of our brand. Peter Hamilton: The mobile moment that you touched on—that’s certainly entrepreneurial. We’ve been talking about all these different pieces in the customer journey and stages on the road and how we think about the road as a part of those moments, or the major contributing factor. Is it acquisitions? Is that a big focus for you guys? Or how do you think about the big parts of the journey, and which are the most important to you right now? Marissa Tarleton: RetailMeNot has been around for about 6 or 7 years, and we have a significant mobile audience already. We’ve almost been relying on the mobile users. So, when we talk about growth now, it’s not about acquisition. It’s actually about quality. Growth is about, “How long will that new user stay with us?” from an audience perspective. And very specific for us is about mobile growth, because obviously, that’s where the trends are going, so we’re really looking at this kind of shopping growth in the app space and the mobile space with mobile users who only have higher propensity to want to use us over time. So, when we look at spending a dollar, we’re looking at mobile opportunity, audience engagement, so there’s just a way from acquisition to being engagement-oriented growth, and with goals around the number of times and the duration a customer spends with us, not just, “Did they come?” but “What was their experience? What makes them come back? And how many different retailers were they exposed to? And are they using our personalization products to go actually have good offers that are location-specific?” So, we’ve gotten much more tactical in how we think about growth, which is, I think, a good financial decision, from an ROI perspective. Peter Hamilton: When I think about our business in the B2B world, I usually say the same kind of thing, that it’s more important for us to go much deeper with one customer than to add in customers every so often. And I’ve always thought that was different than a consumer. With a consumer, you can spread them really broad, get a lot of users, and get just a little bit retail out of them, and that’s how they’re really going to see growth in the consumer category. You’re talking about that not being the case and not being the focus, in terms of how it is you’re going to drive real growth. Peter Hamilton: Half of your money? Marissa Tarleton: 25%? Well, keep in mind — it depends on the size of your base. So, as I mentioned, RetailMeNot has the benefit of large audiences already, so we weren’t always that way, so we grew up to that point, and now we have the benefit of being able to make smart decisions around retention. But that’s not just your paid — we have CRM and LCM strategies that allow us to do that. Peter Hamilton: We see some things where I’ve acquired an enormous amount of users, especially for a retailer, and getting enough long-term value and purchase behavior — I’m seeing the customer base as a real challenge. So, you kind of talked about half reengagement, half acquisition. Where are the big focus areas for acquisition? What is your team focused on the most, making sure that quality is right, whether that’s channels or just the kind of behavior you’re looking for? How are you thinking about that problem. Marissa Tarleton: We look at our audience. I think we all have to start knowing who your consumer is and getting to know where they shop and engaging with them where they are. So, our acquisition strategy is very focused on a very specific demographic of people, and we know when they shop, and we hone in on those people. So, broadly, we look at something that we call our enthusiasts. I can spend 15 minutes talking about how I define it as a woman, in this case, with two kids, and all that, these days. But we also, then, go look at the products that we offer and what the products, then, are that we could offer up to those people, at what period of time. As an example, it’s Mother’s Day. We know a lot of great things that we’re talking about finding on Mother’s Day. We know that this is a deadline opportunity for us, from an acquisition perspective, around people buying for their mother and then mothers buying for their mothers. So, we get very specific around seasons, around key demographics, key audiences, where we know we can have a very high impact. We also spend the majority of our money in digital, where we can really measure every value add, either from an ROI perspective or long-term acquisition, so we know we’re getting value from it. So, we are very specific, from a measurement perspective, on that, too. Peter Hamilton: And you talked a little bit backstage about the earned media and television spots. Can you go on to talk about what RetailMeNot is and how it is a big help — Mother’s Day is coming up. How do you think about that part of the mix? Marissa Tarleton: At RetailMeNot, as I’m sure most of you with top brands know, I don’t just have cap goals. I don’t just have ROI goals. I have brand goals, and I want my brand to be more considered than it is today. So, I think content — and that can be in the form of television on the view, or it can be in the form of social media, or it can be in the form of video content — in many forms, is one of the most important ways to drive new patrons and stickiness within the product. You get people thinking differently about your brand. So, I think supplementing the digital spend with something — and I do mean supplement, because the majority of what we do is digital, and it’s very in corner from an ROI perspective — but I think that we still spend about 25% of our time and money around content marketing, whether it’s RTV or in print or social media to drive engagement and stickiness. Peter Hamilton: Even in the game category, we talk about — certainly, people are investing very heavily in television. We find that we have paid advertisements going on. It’s almost a pure brand — you’re trying to get people familiar with the brand, and it’s important to that whole store of where retail’s going. Marissa Tarleton: Right, most of the data — we’ve done extensive testing that says, if you just run a digital ad, you make so much progress and people thinking about you differently. If you run digital, plus potentially with an email and digital, plus them seeing a video from you on Facebook Live, plus having them see you on TV — out to the far right, in terms of people thinking about the brand differently — it’s significant. So, I can’t stress enough that we need different marketing. We’re very digital and mobile in where we spend our money, but I think, if you really want to drive change in what people think about you, and growth, you have to invest in a good marketing strategy. Peter Hamilton: Let’s switch over to the bottom of that. What is the biggest boomer in the bottom one? How do you actually make that work? Marissa Tarleton: Well, we love our search, and we love our email marketing, and maybe that’s our email marketing, but we take personalization very seriously, so what works best for us is a personalized offer, whether or not it’s done through an email or a push notification that we know will drive action. So, the cool thing about RetailMeNot is that people are trying to get us to get them looking to shop, and we have shopping deals. We’re very in the moment already, and so we have all these offers, when you’re standing outside of a mall, for deals at a restaurant or Old Navy, etc. That’s effective and highly measurable, from the footfall perspective, ROI spend. And we offer retailers — they can see our importance. Peter Hamilton: And because you’re sort of across retailers, you’ve got a massive ability — you’re able to pull together this data across lots of different demographics and locations and verticals and all these different things. So, how would you — and so, in that sense, you’re a retailer of retailers, right? How do you talk to your customers and those retailers that are trying to grow, as well, about their user experience? What part does RetailMeNot play the most actively? Marissa Tarleton: Yeah, I think it’s a great question, and I heard you talking a little bit about Amazon, because I think a lot of retailers — maybe it’s not Amazon, but I think a lot of retailers, about what they do to compete with the growth of Amazon since it hit the online phase — one of the things that I feel like we continue to forget is that 9 in 10 shoppers don’t go into the store to buy, period. Retail is growing. 9 in 10 shoppers don’t go into a store to buy. 80% of them are using their mobile phone to do it. So, the interesting phenomenon is this opportunity to actually make in-store better, make the store use mobile to influence where they’re going to shop, and then focus on that store experience to be competitive, to prevent them going back onto an app like Amazon and buying that way. So, that in-store opportunity and that mobile in-store connection is where I hear retail brands struggling, and where RetailMeNot is currently adding to that value. Marissa Tarleton: It comes down to personalization. With many of our digital marketers, we probably talked a lot about personalization. But how many of you think that there’s personalization happening in retail today? Raise your hand if you feel like somebody’s doing good personalization. There’s a few really good examples, but you don’t feel like you go into an Old Navy and say, “Yeah, they really knew that I was looking for something specific. 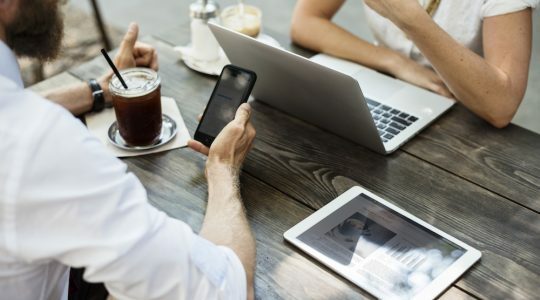 The integration that they have with their website or their mobile thing, for their deals, is really strong.” So, one of the things I talk to retailers a lot about is, “You need to think about” how to differentiate themselves. It’s personal. Take the best practices from digital, and apply them as much as you can to the store, so that it feels like one experience. Back to the mobile touchpoints — consumers are on their websites, and they’re on their phone, looking at alternatives to you, and they’re in your store, so the more innovative you can be around delivering personalization and omni-channel experiences and discounts and sales and content, the more successful you’ll be. Peter Hamilton: So, what’s keeping that from happening? Because we know we don’t get it. Peter Hamilton: OK, why retail in particular? Why would they not be moving as fast as travel, for example? Marissa Tarleton: It’s a great question. I think that some of these companies started 100 years ago, with a customer experience value proposition. They didn’t start with technology bases; the way Internet companies have established themselves. So, if you look at new retail, like that category, there’s a ton of new categories that are popping up that are having remarkable success, and ones that are struggling, like ones that really started without a ground foundation, and just haven’t figured out how to capitalize on what customer service looks like in the retail world. Peter Hamilton: Those that are investing, and it does seem to be working — what do you think is the differentiator? Is it the teams that they’re hiring? Is it just the way that the product relates to people? What is it? Marissa Tarleton: I think—I used it for a plug as one of the things that I used really well, and they’re truly thinking about the consumer and the user. They’re not thinking about their retail stores or their website. They’re thinking about, “What does this end user need when they’re buying what we’ve got, and how do I give them what they need that’s consistently the same in the store, online, and on their mobile apps, so that when they walk in, it’s fully integrated?” Starbucks is another good example, where it’s all this kind of ease of use and omni-channel value prop gap that a lot of their competitors can’t solve. Peter Hamilton: I want to sit here, just for a minute, and talk about fraud. And we did spend a lot of time talking about this previously, but it is certainly on the top of many marketer’s minds, driving more downloads, and then they realize, “Oh, not all those downloads turn into real users doing real things.” How does your team think about fraud, and how do you deal with it, or have you, over the last couple of years? Marissa Tarleton: Yeah, fraud—you know, for any major commerce company, and in our case, we’re facilitating commerce for so many partners — fraud is a number one area of focus for us. We want to be prepared to make sure that we’re driving quality data, traffic, to their experience, but also our own customer experience products and concerns, so we’ve invested in fraud in a couple of ways, one, from just a normal support perspective, for consumers and retailers to directly relate any concerns, but from a download and acquisition perspective, it comes down to triangulation of data. And we use multiple data sources to ensure that whatever we’re driving is actually a real value to customer, not only as they’re acquired, but over time, right? And I’m sure we’ll talk about lifetime value of a customer. But one of the things that we change is, we don’t just look at download. We look at what that user will do over a 12-month period of time with us. And we actually change our apps on a pretty regular basis, like weekly and sometimes daily. You see a one-and-done type of user, which we believe is either fraud or potentially just didn’t care about it, and we shift our money to ensure that we’re putting more dollars towards consumers who want to stay with us. Peter Hamilton: This idea of quality is different here, versus something that’s clearly negligent and clearly fraudulent or trying something illegal. It’s something that we kind of dealt with very personally as we were looking at how we help our consumers really buy what’s valuable and make sure that they don’t buy what’s not. And so, over time, we see the industry taking a stronger and stronger position, using the word fraud, and focusing it that way, saying, “This is bad. 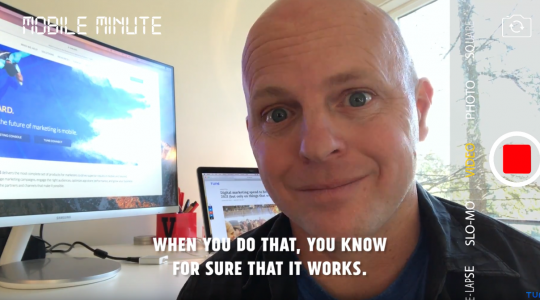 This is good.” But what I hear from you, and I hear from the most marketers that have had the most success is that they think about, “What did I drive? Did I get real value out of this?” And that helps determine if people are really interested, what the quality of the traffic is, more so than any of these other indicators. Marissa Tarleton: Right. Ultimately, every dollar that I spend, most dollars that I spend, have a direct ROI relationship on them, and so I can actually manipulate and measure whether or not I’m having a quality or fraudulent download, just based on the revenue associated with that user and how they’re coming to that, and if it’s a repeated sale. So, search through some of those metrics, and you have the ability to track ROI, and have us check it. So, it might be that you guys will get the Tune data, but also RetailMeNot is, and we’ll say, “OK, we’ll take that,” and ask for data to make sure that we’re looking at the same thing in this direction. Marissa Tarleton: Well, and it’s really into the main — I’m sure most of you have seen or heard of data around this massive underspend, so consumers are shopping in mobile, but nobody’s advertising in mobile still. I mean, that probably has been changing with each year, but that is entirely because it’s so hard for us to measure mobile, and we have this perception that mobile is all online. And yes, e-commerce and Internet commerce is going to be, obviously, a continued up and to the right growth category, but I still think we continue to underestimate the impact that mobile can have on in-store, and the opportunity to connect mobile to in-store footfall and foot traffic, and that’s the hardest thing to measure, right, that whole attribution piece. So, I think there’s amazing partners out there that can help in measurement. From RetailMeNot’s perspective, and from our customers, we talk a lot about quarter and that kind of distribution. There’s a lot of alternatives to that, both in mobile commerce, but also in mobile to in-store, with mobile attribution to footfall, and I recommend people look at some alternatives and use all of those data points, not just the one that you get first. Peter Hamilton: I couldn’t agree more. One view of a multi-platform solution is only one slice, one way to look at it. And there’s no one-size-fits all for everything marketers need to be looking for. 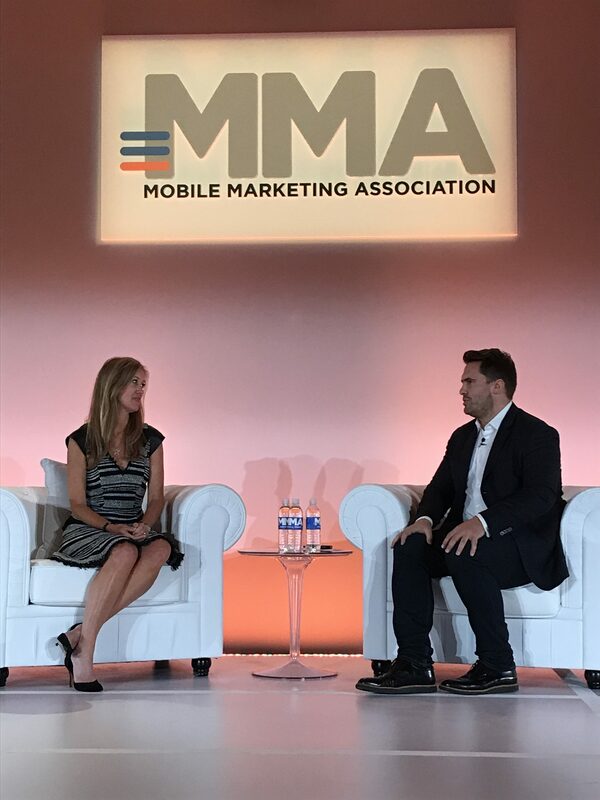 One thing that we talk about at the MMA is certainly not just the — all of the issues that you’ve talked about around the customer journey at your level of sophistication — it’s wonderful to be able to articulate where we focus and what we support and all of these things. But there’s probably quite a few in the room that can do that, as well, and talk to some of these points. But how do you build an organization that actually lines up with that? How do you create people that can get behind each part of this customer journey with the right focus on the right things all the way through? How have you thought about that in your company? Marissa Tarleton: For me, it starts with your key — I don’t know if any of you are familiar with OKRs. Raise your hand if it’s painful. So, you guys are seeing objectives and key results — it has to start with what you’re trying to accomplish. And so, from my perspective, my main objective is not downloads. My main objective is my brand growing, and am I generating high quality and efficient ROI traffic with downloads? Which means I have to shift my acquisition into reengagement, and I have to invest in content, and it’s going to change how people perceive us as a brand. 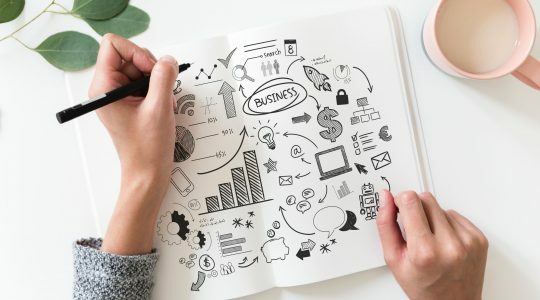 So, if your objectives are not just traffic and not just downloads, your actions are going to take a slightly more integrated marketing approach. So, we use that tactic. Somebody with that will have to go in and hire marketers, go in and invest in brand and research leadership that in the past he hasn’t had. So, it has to start with you. Peter Hamilton: And how do the acquisition marketers, versus the content marketers, versus the engagement marketers — how would they get along? And how does that sort of coordination work? Marissa Tarleton: It’s never dull in marketing. I find that the more — I always look for people that have a great balance of creative and data-driven approach, and so if you can find both, and they can get along smoothly — we do so much based on promotional and seasonal calendars that we all have goals around what we’re going to do for back to school. We find that we can’t do a good digital campaign unless you operate with strategies that complement it on social. So, if they work really well together, they can do a kind of data-driven, creative content marketer, not just one that makes it old school. Peter Hamilton: OK, I have maybe a moment for a question. Is there anyone from the audience that would like to ask Marissa a question for both of us? We only have about one minute. Go ahead. Question: How do you capture the change in branding and quantify the result? Marissa Tarleton: Yeah, the brand — we use a brand tracker. There’s many out there. We use Helton, and we do every two months — we do a survey to our entire audience, and we manage a series of thousands of questions, where I really will determine how my competitors are tracking, how I’m tracking, based on brand and also perception and what’s driving that, and then I also look at what advertising and content vehicles are actually moving the needle. So, I can actually tell you whether or not TV, in particular, placement on view and RTV, is having in online brand at a high level, the same as brand — our mobile advertising. So, it’s not an exact science by any means, but we invest in it, because it’s really important.